Jane Iredale Makeup PurePressed Foundations& PurePressed Refills. 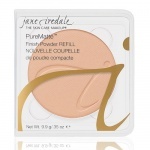 Jane Iredale Pure Pressed Mineral Makeup contains 100% pure, crushed minerals derived from the earth. It is Free of preservatives, talc, oil, fragrance, dyes, and other chemicals that can irritate skin. It is extremely versatile and can conceals blemishes, scars, sun damage and discoloration flawlessly. Jane Iredale Pure Pressed Foundations are a multi-purpose makeup tool giving you a concealer, foundation, powder and sunscreen all in one. The minerals used in Jane Iredale Pure Pressed Bases reflect the light and therefore have a much wider colour tolerance than most makeup, making it easier to match with your actual skin tone; for a flawless and natural finish. The mineral additives used in Jane Iredale PurePressed Base actually serve to calm inflammation and provides bacterial protection, making it the perfect makeup partner for sensitive, rosacea prone and acneic skin. The Jane Iredale Foundation PurePressed Base Refill Warm Silk is a light coloured foundation with warm yellow undertones. The Jane Iredale Foundation PurePressed Base Refill Amber is a light to medium coloured foundation with warm yellow undertones. 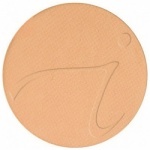 The Jane Iredale Foundation PurePressed Base Refill Suntan is a medium coloured foundation with neutral peach undertones. The Jane Iredale Foundation PurePressed Base Refill Ivory is the lightest base Jane Iredale do with netural undertones. The Jane Iredale Foundation PurePressed Base Refill Natural is a light/medium coloured foundation with cool pink undertones. The Jane Iredale Foundation PurePressed Base Refill Light Beige is a fairm coloured foundation with cool pink undertones. The Jane Iredale Foundation PurePressed Base Refill Riviera is a medium to dark coloured foundation with warm peachy and golden undertones. The Jane Iredale Foundation PurePressed Base Refill Autumn is a dark coloured foundation with cool orange undertones. The Jane Iredale Foundation PurePressed Base Refill Caramel is a dark coloured foundation with neutral gold undertones. The Jane Iredale Foundation PurePressed Base Refill Fawn is a deep coloured foundation with golden and olive undertones. The Jane Iredale Foundation PurePressed Base Refill Chestnut is a deep coloured foundation with cool red undertones. The Jane Iredale Foundation PurePressed Base Refill Teakwood is a medium dark coloured foundation with cool pink golden undertones.